From October 1-4, 2010 the conference was carried out in Athens – Greece at the Foundation of Arts and Music Teocharaki,a wonderful venue in the centre of Athens. Occasionally this conference has coincided with the 30th anniversary of AIMC’s foundation in 1980. The high interest for the congress showed best the number of almost 200 participants from all over the world especially from Greece,a country with a strong Byzantine tradition. This great interest might have been a symptomatic desire to become acquainted with the newest trends of contemporary mosaic in the world. In particular it was a special request of Nikos Tolis, the appointed president of the congress, who, together with his fantastic assistant Artemis Klitsi, did really a huge job to make this meeting in Greece possible. They organised this conference, the exhibition, and the following sightseeing tour in their own account. Compliments, and hats off to such a successful performance! Summing up this conference and the extensive exhibition of mosaic works and posters have been mainly a demonstration face by face with the different interpretations of contemporary mosaic, an open controversial discussion all along. Therefore in a personal statement I have set forth my considerations and experiences which you will find attached. The occasion to hold a general assembly of all present AIMC members is given every two years, usually at the end of such conferences: In the first line the different activities of our association were examined more closely, and the improvements of our administration work in our headquarter in Ravenna were represented which took an essential part of the vivid discussion. Here I want to mention the unanimous confirmation of the appointment of a general secretary. Rosetta Berardi of Ravenna was willing to take over this responsible task already almost two years ago, a lucky chance for a perfect run in our office and in co-ordinating the most important current tasks. But one of the main concern we had to carry out was the election of a new directory of the AIMC according to our statutes. AIMC, The International Association of Contemporary Mosaicists held, on October 2010, in Athens, Greece, the 12th International Congress of Contemporary Mosaic and the related International Mosaic Exhibition, celebrating at the same time its 30th anniversary since its founding at Ravenna, Italy. 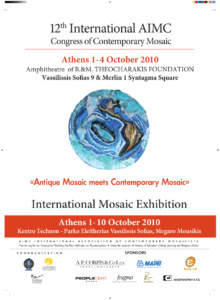 These events, the international mosaic congress and the exhibition occurred for the very first time in Athens, a great honor for the city and were held in collaboration with the Cultural Organization of Athens’ Municipality, under the auspices of Greek Ministry of Education, Lifelong Learning and Religious Affairs. The congress took place at the Amphitheatre of B. & M. Theocharakis Foundation for the Fine Arts and Music, at the city’s heart center, at Syntagma square, from 1-3 October. 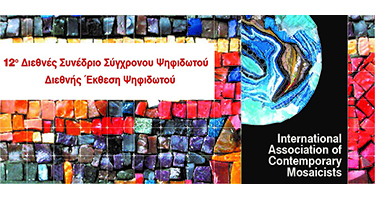 The congress concluded the following day, October the 4th, with the general assembly of the AIMC members, which took place at Novus City Hotel, Metaxourgeio square, Athens center, where the AIMC members stayed while being in Athens. To honour the occasion of AIMC’s 30 years birthday, the appointed cultural official of the municipality of Ravenna, attended the works of the assembly. At the international exhibition, which took place at the Art Center of Athens Municipality at Vassilissis Sofias Ave, (one of Athens most classy avenues), from 1-10 October, 120 artists from 21 countries displayed their art works. Every two years, AIMC, the well known unique international organization concerning mosaic, holds its congress in a different country, aiming to give a multicultural means of expression to people who are involved with and are interested in mosaic. The year 2010, was Greece’s turn to host AIMC congress, for the first time, as already stated in AIMC history. In the country where the history of mosaic goes back more than 2400 years and where mosaic techniques, discovered so many centuries ago, are still, up today valid, this congress offered the opportunity to artists, university professors and scholars, archaeologists, architects, conservators, art historians, writers and mosaic, fine arts students to gather for a common cause: to unfold their ideas and present their works in order to reveal the centuries long-lasting possibilities of mosaic and its dynamic evolution through the 21st century. The main theme of both events –congress and exhibition- represents the special interest which they had for the Greek mosaic reality: ‘Antique Mosaic meets Contemporary Mosaic’. The strong ancient Greek and Byzantine mosaic heritage has a continuity in today or it stays enslaved, petrified within the frames of tradition? The ambitious target of the congress and the exhibition was to identify and acknowledge the possibilities that mosaic holds as a modern-contemporary visual and utilitarian expression means, i.e. to present mosaic as a nowadays artistic tool of expression. This target was aiming both at the ‘specialists’, the people who deal with mosaic and at the congress audience and exhibition visitors, two target groups dominated by the greek, millennia long, mosaic cultural heritage. At the 170 seats’ amphitheatre of Theocharakis Foundation, through the 3 days of the congress, 230 participants attended the congress works, 70 of them non-Greeks (Participating countries: Italy, Germany, Austria, Japan, Bulgaria, Brazil with a solid group of 18 people, Egypt, Canada, Cyprus, Russia, Norway, Poland, Serbia, Uruguay, France, Turkey, Denmark, U.S.A., Czech Republic, Great Britain, Australia, Argentina). 51 presentations were made, from 27 foreigners and 24 Greek speakers. At the exhibition participated 120 artists (40 foreigners and 80 Greeks), displaying 140 art works. To commemorate the event, an exhibition catalog was published. Greek artists produced original mosaic works, the themes of which moved –honoring the title of the events- within a broad spectrum, from ancient Greek inspiration and byzantine religious presentations to contemporary mosaic art works. Foreign artists focused mainly on contemporary mosaic art works, proving to Greeks that sticking to a country’s cultural heritage sometimes can become an obstacle in keeping up with modern needs of expression and at the same time, giving them food for thought. Most of their works were displayed in the form of posters, because of the obvious reasons of huge transportation costs, while some of them displayed small original mosaic art works, created specially for the exhibition which they carried with them during their trip to Greece form all over the world, a very kind and highly appreciated gesture from their Greek colleagues. Since it was the first time that an event like this exhibition took place in Greece, the response of the public was very warm, with more than 400 visitors at the exhibition opening and many more during the 10 days that it lasted. Both congress and exhibition were unique events for the Greek artistic mosaic world. It was the first time that so many people involved in the mosaic, ‘specialists’, met with each other and gathered together, for a common cause. Up to now, mosaic in Greece was a lonely issue, each artist remaining in his own private safety zone, not sharing experiences, artistic ways, expression tools, practical means of working methods. And it was a revelation for them to meet so many artists from other countries, each of them bringing his own stigma and personal language, open to present and share his methods and ideas. The congress acted as the incentive for the formation of the Greek Mosaic Association, which aims through various ways and actions, to join Greek mosaicists to the common cause of mosaic art evolvement. There was a question stated in a former paragraph. We pointed previously the result of misused cultural heritage. We Greeks, are honoured and privileged by our cultural heritage which can and must be used as a step stone, a solid pillar, to move forward and evolve mosaic art, because only through this path we create continuity and enrich our heritage and tradition, by transforming it to a living body.